It’s been a week…almost. A week since surviving the Great White North that was Cyclocross Nationals in Madison WI, and all the “fun in the sun” that came with it. Its been more than a week since having my trust and opinions on disc brakes on cross bikes tested to the nth degree. A week since my being a “Realist” has unfortunately made me rethink my personal stance on the awesomeness of disc brakes in the most equipment cruel discipline (outside of downhilling) in the cycling genre. I love disc brakes. From a mechanical standpoint they make the most sense. Stopping power is “consistent.” Rim wear is not even a topic. Disc brakes requires a mechanic that knows and understands the physics of wheel building. Clearance is amazing with disc brakes on frames. Less power is needed from the rider when it comes to long sustained braking, or short hard efforts (such as coming into a corner hot). If you throw a rim/break a spoke, you still have brakes and stopping power. All that being said, disc brakes on cyclocross bikes are something I now believe need a bit of work. I used to think that all the Euro Pros…Nys, Albert…etc…were just being typically “euro” in their not using the newest, hottest invention on the block, and sticking with the cantilever dinosaurs of the stone age. Not so anymore. After watching brand new pads get roached, yes roached, in one race, and then seeing guys scramble to find every Torx-25 wrench in town to take into the pits so the brakes could be adjusted as much as every 1/2 lap due to wear and the non self-adjusting mechanical calipers, I now know why. Yes, they still “work” better than the canti’s, but at what cost? You’re fighting for the podium spot, its muddy/wet/sandy and right when you come around that last corner before heading into the pit (because you have to, not because you need to), you grab a handful of brake lever and…NOTHING! I saw guys grabbing brake lever for days after a 1/2 lap and efreaking out more, if they waited for a full lap. The sand and water/ice/snow, mixed with mud turned the rotors on the hubs into really fancy belt sanders. They took brand new Metallic disc brake pads (the most durable on the market…not that organic or semi-organic stuff) and wore them down like dragging a Crayon on hot asphalt at 50mph. Then there’s the wear and tear on the rotors themselves. No one seems to think of these essential bits in the disc system. Yeah, they look strong and beefy, but when you add up all the rotations on the metal disc with a water jet mixed with sand (think bead blasting), you’re not doing them any service either. Same thing happens to alloy rims that use rim brakes. When you get to a certain thickness you run the risk of warping a rotor faster, heat doesn’t dissipate like it should, causing issues internally in the hubs…after all, that heat has to go somewhere. The riders I took care of last week at Nationals that were using cantilever brakes never complained about losing all the brake pull in a lap. They may have complained about not being able to stop, but hey, its cross afterall! You just need to slow down. I also kept an eye on pad wear compared to the riders using disc brakes. It was negligible at most. I’ve got a couple of bikes in the shop this week, gettting them ready for Worlds in Louisville, and the pads (once sanded clean) still have plenty of life in them. So, enough about complaining and hopefully you all see the point in my change of heart towards disc brake usage in cyclocross. Afterall, you never “hear mtb’ers complain about their disc brakes. Actually you do. After getting caught in a rainstorm, I usually see mtb’s in the shop for complete pad overhauls. Most mtb’s and their riders don’t ride when it’s wet out. It ruins trails, ruins drivetrains, and other parts people don’t like to replace more than they have to. So when it comes to cross, a discipline that thrives in the mud and muck, yeah it comes to the forefront. How can these issues be resolved? Well, outside of someone being on a professional team and having crates of brake pads to replace when needed…yes that’s how it works in the real world everyone…there are few a ideas. Now, as to when/if the industry will address these issues, I don’t know or will speculate. I’m not being paid by anyone to have that kind of info. These are just a few ideas that came to mind. Wait till all component manufacturers have hydraulic shift/brake levers: This will help only with the self adjusting aspect. Tim Johnson didn’t need to pit as often because he was running the prototype SRAM levers. All the other C-dale boys were in and out of the pit more often than not. Create pads with more pad/calipers to accept them: Not a very smart idea. It doesn’t really solve the wear and tear. It would simply mean your pads get more expensive and your calipers as well. Create rotors with different materials: again, same reasoning as the pad material. Problem is weight. They’d get heavy, say if you ran a steel rotor that didnt wear as fast as an alloy one. Weight weenies wouldn’t like it. As I said, those issues may or may not address by the industry. I can tell you it’s tough to hear your clients/riders (who pay to race) complain about all the stuff that costs money these days, and adding this issue to that already long list definitely deters me from recommending disc brakes on cross bikes to the everyday Joe/Jane. It’s tough really wanting something to work out well, and yet the reality of the situation is not up to your wants and desires. I have high hopes for discs as they transition to the road as well. I dont think the wear issues will be as much on the road, again not many people really ride when it’s wet and, for the most part, you don’t get 2 miles of sand/mud to ride through on pavement (Note: we ride in the PNW wet). Nonetheless, I’m still crossing my fingers that something happens that at least addresses a couple of the points above. If not, then I’ve a feeling cyclists will vote with their checkbooks. 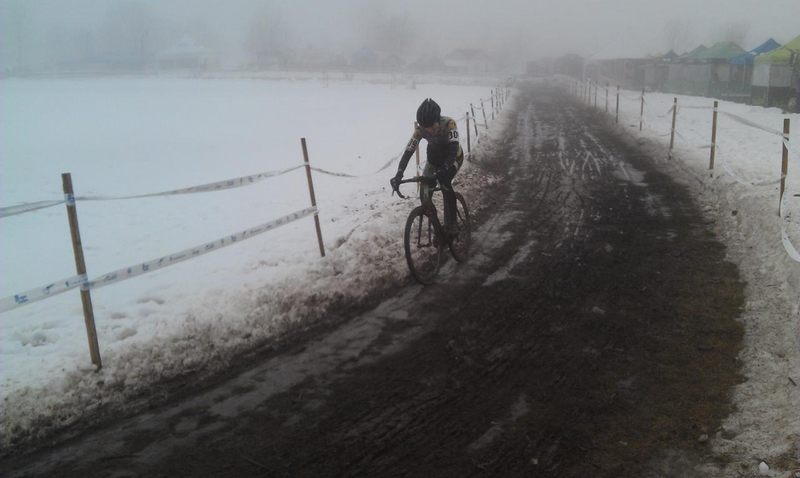 It can get expensive if you have to replace $20-$40 in pads every weekend you race cyclocross in the slop. So if you have disc brakes on your cross bike, I’d suggest you learn how to modulate speed/braking/cornering to extend your pad life/wear. Also, I’d recommend you check your pads after every ride/race and have them sanded smooth and your rotors cleaned.